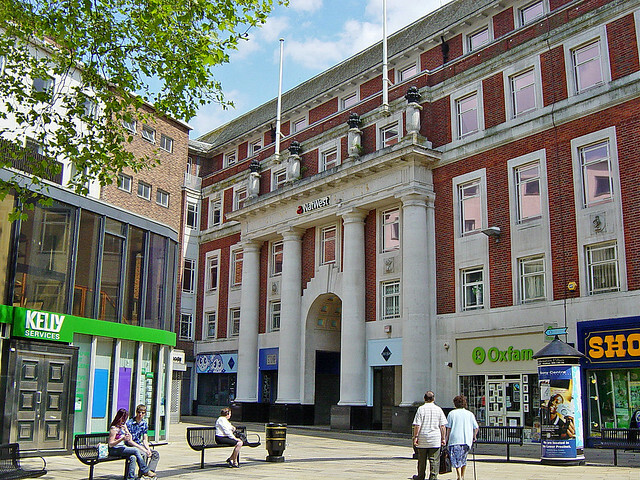 Prof, Your photo on post 141 would have been as I saw High Street as a kid of 6/7, I always hoped for a Roman Legion to leave or enter the bank. This was the beauty of Coventry for me, one minute you could dream of ancient Rome, walk a few yards and dream of Crusader Knights, but come down to earth when I watched the Bantams. Passing through these old buildings another world opened up, a privilege no longer attainable in modern society. Kaga, I am sure you would need the Tardis to recapture your past years, judging by your view of the High Street. I agree some of those buildings seem years apart as we look at them in MR's post. As a child I was always fascinated by those beautiful doors as you enter the bank. Thanks MR for your pics. Midland Red Sure looks different on 693 photo topic Broadgate, but truly great photo's from you, many thanks. 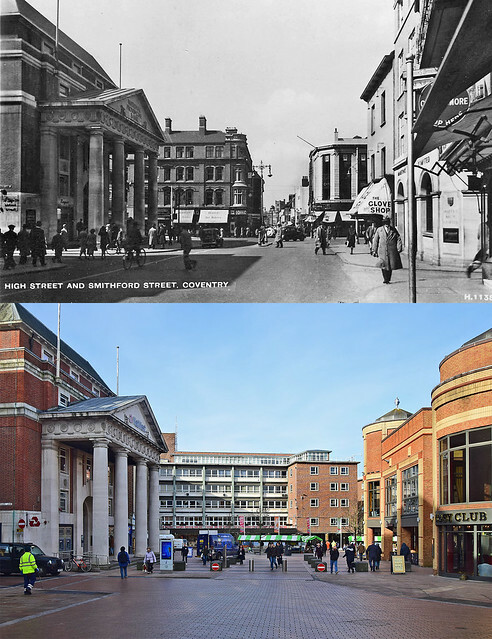 Excellent before and after match there MR.
That 1930s image with High Street linking directly to Smithford Street reminds me that the post-war city lacks 'streetscapes' like this now and is now really a large 'private' mall surrounded by fragments of older streets that seem lost between it and the ring road (although I don't dislike the post-war stuff as much as many people do, and the original planned precinct would have been a continuous scene). Kaga's comments make me remember when I first came to the city in 1989 to study, and found the place a bit of a rabbit warren of precincts, bridges, car parks and linking tunnels. And further out the ring road junctions a baffling mass of twisted concrete with networks of tunnels underneath them. For someone from a small town of barely 30,000 people it felt quite intimidating but also a little exciting. I remember walking with some friends to visit someone and having no idea where we were going, I just remember smelly, damp tunnels and feeling a bit lost. I first saw Coventry in about 1991, when I think it was about to turn an architectural corner. The post war building, especially the 70s, was dire. The Precinct had ended up without sight lines as flapdoodle writes and was a very confusing mess. For those who've known it for a long time, it's hard to see that it is improving but as an outsider, it is much better. The new buildings, with the exception of the University Library, are reasonable to look at. Even the makeovers of the old tower blocks (hopefully without flammable panels) look good. One of the places that seriously needs work is Cross Cheaping. Dirty, ugly and very run down, it's the place people often have to move through to get to the better parts. It's a key part of the bus system. It's a large chunk of old Coventry but doesn't feel loved at all. It's even a bit scary. Because of the way the city functions now, you can only easily go out the route you came in. That applies to pedestrians. I found that there were large parts of the city I never visited because getting there involved a change of entry and car park. I'm still loath to use another car park than the Belgrade Plaza or West Orchard because I find the roads bewildering. I'm hoping that the new one at Salt Lane will persuade me to try because it will be closer to the Herbert and let me explore towards Gosford without having to march across the city first.